For over four decades now, Corky Siegel's Chamber Blues has been delighting audiences throughout the U,S. with its unique hybrid of classical chamber music and blues tradition. Blending blues harp and piano with a string quartet and percussion, Chamber Blues is innovative, yet immediately accessible. 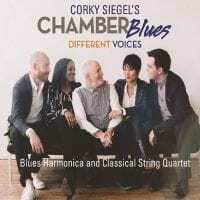 Corky Siegel is internationally regarded as one of the world's great blues harmonica players, and is a celebrated composer, blues pianist, singer, songwriter, bandleader and author.